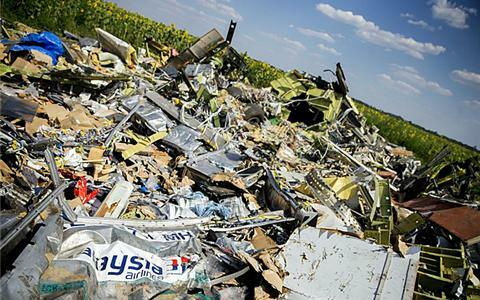 ‘No proof’ of technical fault in MH17 crash’. Dutch experts release highly anticipated interim report into downing of Malaysian flight in conflict-hit east Ukraine. The first report on Malaysian Airlines MH17 flight, which crashed in eastern Ukraine in July, suggests that there is no evidence of technical fault or pilot error. Dutch investigators said in the report, which was published on the website of the Dutch Safety Board (OVV) on Tuesday morning, that a large number of high-energy objects caused the passenger jet to break apart in midair. The Boeing 777 exploded en route from Amsterdam to Kuala Lumpur, killing all 298 people on board including 193 Dutch citizens. According to the report by Dutch experts, the fact that there were many pieces of aircraft structure distributed over a large area indicated that the aircraft broke up in the air. The findings also suggested that all crew was properly licensed and had medical certificates. The plane was also in airworthy conditions to make the flight from the Amsterdam Airport Schiphol. “The communication between the flight crew and members gave no indication of any mamalfunction or emergency prior to the occurance,” Dutch investigatiors said, adding that engine parameters were consistent with normal operation during the flight. Investigators came to their findings based on information from the aircraft’s black boxes, and pictures and video taken at the scene, as well as information supplied by Ukrainian air traffic control. The “black boxes” have been shipped to Farnborough in Britain to be examined by the Air Accidents Investigation Branch. The OVV had said the preliminary findings would be “factual information based on sources available to the OVV”. “We investigate the cause of the accident and not who’s responsible,” Vernooij told AFP.